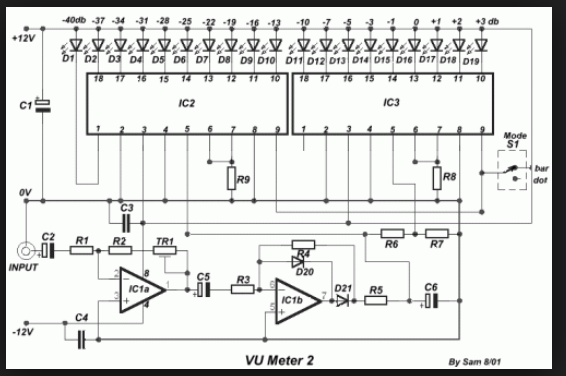 This 19 LED VU Meter circuit was designed by two monolithic integrated circuits to measure the level of audio signals whose unit of measurement is known as volume unit. The circuit round the IC1 makes input adaptation and amplification with the trimmer TR1 [GAIN]. The circuit round the IC2 makes half-wave rectification of acoustic signal. With switch S1, we select the type of indication, that we will have from the LED. With the prices in resistances R6 and R7 that exists in the circuit, the level of signal, in the entry is 7.8V (gain of first stage IC1, is one), and the difference of level between the LED D10-11, should are 3 db. The positive department of supply, should have the possibility of giving more current, one and it is overloaded with the current of LED. R1-2   : 10Kohm      C1   : 100uF/25V       D1-19 : LED 3 or 5mm any colour.